_secret. The API client secret (i.e., client password). Client secrets should never be publicly exposed. _settings. Configuration endpoint for the API client settings. name. Name (and description) of the API client. ipWhitelist. Collection of IP addresses allowed to interact with the client; for example, the address 192.168.1.0/24 allows access to IP addresses 192.168.10 through 192.168.1.255. The default value is 0.0.0.0/0, which allows access to all IP addresses. features. Client features associated with this API client. Clients can be associated with more than one feature. Your API call must have the owner permission in order to return client data. "name": "This is a client description"
The following table includes information about some of the error codes that you could encounter when calling this endpoint. You either failed to provide credentials or provided invalid credentials. This endpoint requires Basic authentication. Error Message: Client ID not found. Error Message: Application ID not found. You did not provide a valid application and/or client ID. name. The only required property. If you do not specify a name your API call will fail. ipWhitelist. JSON array of Classless Inter-Domain Routing IP addresses; only the addresses included on the whitelist will be able to interact with the client. 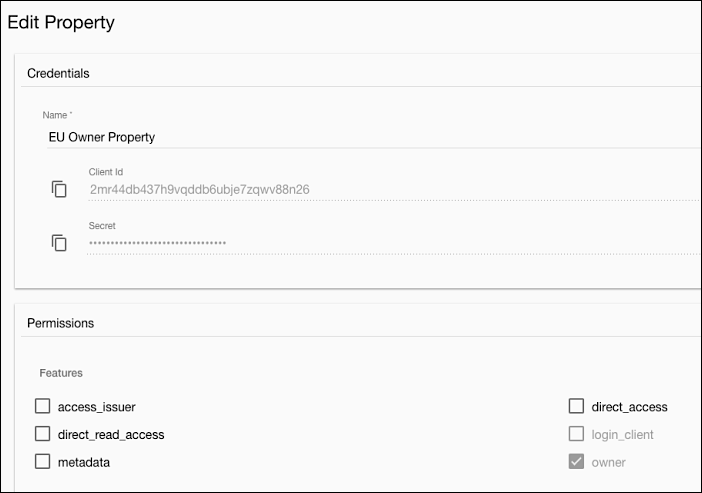 If you do not include the ipWhitelist property then the value will automatically be set to 0.0.0.0/0, which allows any IP address to interact with the client. access_issuer. Issues access tokens scoped for use will all API clients. direct_access. Has read/write access to all user records. direct_read_access. Has read-only access to all user records. login_client. Has read/write access to the user record for the current user. Login_clients are typically used for login and registration. Clients with the login_client feature cannot be associated with any other feature; for example, you cannot have a client that has both the login_client and, say, the direct_access features. owner. Has full administrative access to the application. Metadata. Does not update the lastUpdated attribute when updating other attributes in a user profile. For example, suppose the lastUpdated attribute has a value of 7/5/2018. On 7/12/2018, you use a property that has the metadata attribute to change the displayName in a user profile from Bob Johnson to Robert Johnson. The displayName will now be set to Robert Johnson. However, the lastUpdated attribute will still be set to 7/5/2018. You do not have to assign a feature when you update a client. However, doing so deletes all existing features from the client. In turn, that client will not have permission to do anything until it has been assigned a feature. 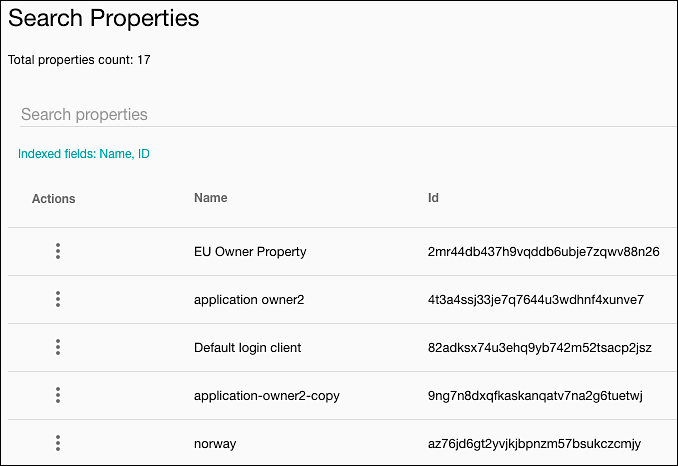 Your API call must have owner permissions in order to update a new client. 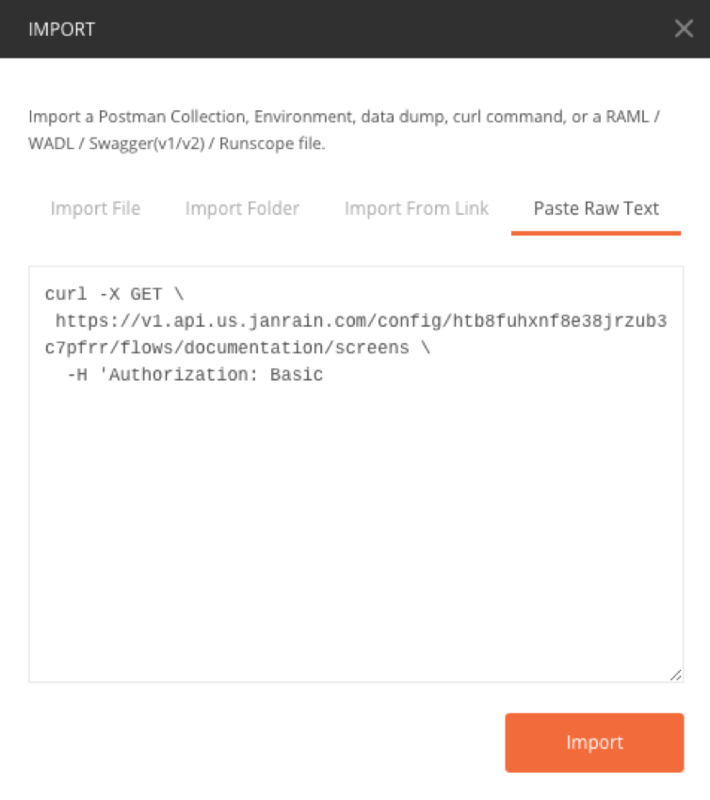 This command updates the API client with the client ID nmub5w3rru9k6rzupqaeb7bbwv6jn658. The client will be renamed Documentation Login Client and will have the login_client feature. Because the ipWhitelist property is not included, that value will be reset to the default value of 0.0.0.0/0. This means that any IP address can interact with the client. Error Message: The metadata feature can only be applied to a client by Janrain. Remove "metadata" from the list of features and try the API call again. Error Message: Missing data for required field. Error Message: Not a valid string. Error Message: Not a valid CIDR address. One of or more of the IP addresses on the IP whitelist has been incorrectly formatted. Error Message: Not a valid feature name. Error Message: Clients with the login_client feature cannot have any other features. Remove all the features except login_client and try your API call again. Error Message: Clients with the metadata feature can only be updated by Janrain. Error Message: Owner feature cannot be removed from the client making the call. After the owner feature has been added to a client, that feature can only by removed by Janrain. You did not provide a valid client ID. Error Message: API client <name supplied> already exists. Client names must be unique across an application. Deletes an existing API client. Your API call must have the owner permission in order to delete a client. Note that you cannot delete any API client that has the owner feature. If your API call succeeds, the specified client will be deleted, and you'll see the response code 204 No Content.